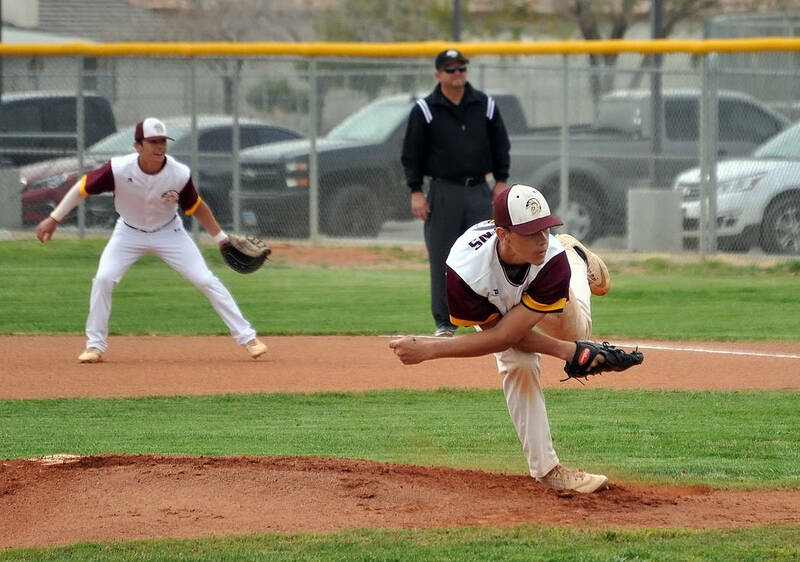 Horace Langford Jr./Pahrump Valley Times Pahrump Valley freshman Zach Cuellar pitches Thursday against Democracy Prep in Pahrump. Cuellar pitched a three-inning shutout against the Blue Knights, then tossed a seven-inning shutout Monday as the Trojans defeated Locke, California, 4-0 in the Blazer Spring Bash in Las Vegas. Horace Langford Jr./Pahrump Valley Times Senior Nico Velazquez takes a throw at third base during Pahrump Valley's 16-0 win over Democracy Prep on Thursday in Pahrump. Horace Langford Jr./Pahrump Valley Times Pahrump Valley senior Willie Lucas looks to throw to first base after forcing out a Democracy Prep runner at second base during the Trojans' 16-0 win over the Blue Knights on Thursday in Pahrump. The Trojans boarded a bus at the school at 5:30 a.m. and headed to Centennial High School in Las Vegas for an 8 a.m. game. After their 4-0 victory over Locke, California, they were back on the bus for a trip to Sierra Vista High School for a 3 p.m. game against the host Mountain Lions. Finally, just shy of 12 hours after they embarked on their trip, they were headed back to Pahrump after a 23-9 rout. Two games against two very different teams in two very different types of games in two venues. It was the kind of day that easily could wear out players and coaches. Unless, of course, you win both games. The story of the opener was freshman pitcher Zach Cuellar, who needed just 79 pitches for the shutout against the Saints (7-11). Cuellar allowed 3 hits and 2 walks with 3 strikeouts. The young pitcher already knows how to do something more experienced pitchers often struggle with — pitching to contact and letting the players behind him get the job done. While Cuellar does have 13 strikeouts in 14 innings, more importantly he has allowed just 8 hits while walking just 2. All but one hit was a single, and opponents are batting a weak .170 against him. “My arm’s a little sore, but that’s it,” Cuellar said after doubling his total innings pitched for the season. The Trojans managed only 6 hits against Locke, but one of them was a 3-run home run by Willie Lucas in the third inning. The senior catcher belted a 2-2 pitch over the 375-foot sign in left-center to put the Trojans on the board. 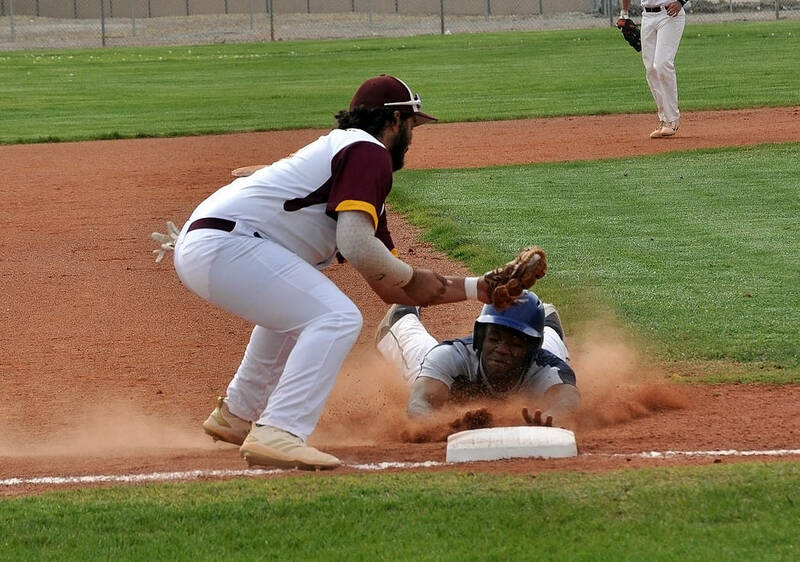 Junior Chase McDaniel had 3 hits and scored twice, while sophomore Jalen Denton had Pahrump Valley’s other RBI. The Trojans found some offense on the bus ride between Centennial and Sierra Vista, because the bats came alive at the expense of the Mountain Lions (4-15-1). A 9-run second inning basically settled the issue, as the home team never drew closer than six the rest of the way. Highlighting that inning was a 2-run double to deep right-center by Dylan Grossell, one of eight extra-base hits by the Trojans, who finished with 18 hits. Freshman Roman Roberts and Grossell had back-to-back triples in the fifth inning, while McDaniel and Lucas hit consecutive doubles in an 8-run sixth. Lucas and Cyle Havel each had 4 hits against Sierra Vista, with Havel going 4-for-5 with a home run, 3 runs and 3 RBIs while Lucas went 4-for-4 with a walk, a double, 3 RBIs and 5 runs scored. Grossell and Roberts also drove in 3 runs apiece, while McDaniel and Denton each scored three times. Lucas and his brother, 2018 graduate Garrett, both have worked with the same batting coach with positive results. This latest visit produced results Hayes certainly noticed. That point is revealed in the scorebook. All nine positions in the batting order accounted for at least one run scored and one run driven in. “We’ve been top-heavy, and if we get key hits from the bottom of the order we’re going to be a scary team,” Hayes said. “It just showed today that when everyone’s hitting we’re really hard to beat,” he said. The Trojans (14-6) continued play in the Blazer Spring Bash on Tuesday by facing Legacy and Shadow Ridge at Shadow Ridge High School, with another game today to be determined. Next week brings a trip to the Coachella Valley Rotary Tournament in California followed by an April 24 game at Valley. 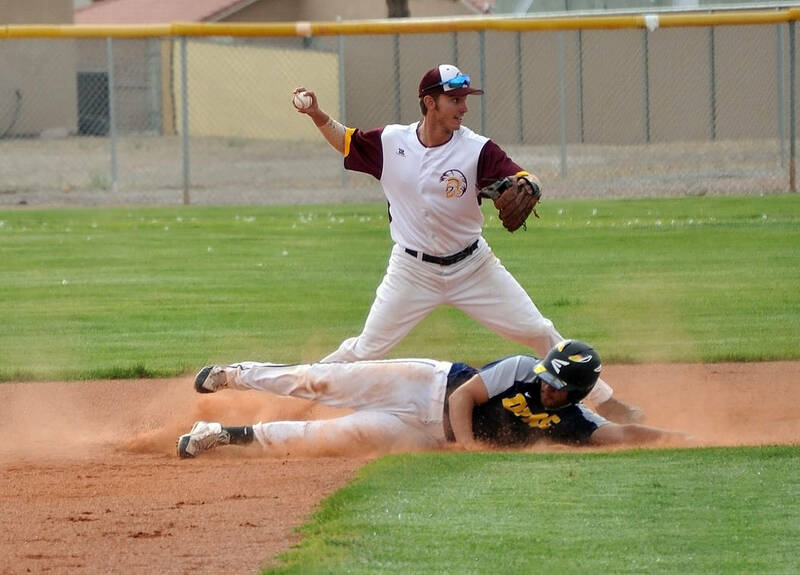 Pahrump Valley’s next home game is April 26 against Del Sol.